A quick reminder: the FP Reading Series is tonight at 8pm. Details are below--see you there! Also, congratulations to Brooklyn's own world boxing champion (and soon-to-be Chabad rabbi) Yuri Foreman, who pulled off the upset on the Pacquiao-Cotto undercard. There's fun to be had in Crown Heights this weekend. Sue Rock Originals is hosting a rent party tomorrow (Saturday November 14th) to keep their space. If you haven't heard about Sue's incredible non-profit, which provides both textile training and clothing to victims of domestic violence, you need to check them out. If you can't make it, you can donate at her website. Further down Eastern Parkway, the black hats are out in force at the 25th Annual International Conference of Chabad-Lubavitch Emissaries. Leading local literary lady (how do you like that alliteration?) Penina Roth describes the area as "a garrison," with "mobile command units, mounted police, motor bike cops and squad cars and foot patrols everywhere." With a little luck, they'll have something to celebrate on Saturday night, as Brooklyn-based Chabad-rabbi-in-training Yuri Foreman fights for the World Super Welterweight belt. And of course, if you make it through the weekend, you can look forward to the November installment of the Franklin Park Reading Series on Monday, November 16th at 8:00 PM. Penina continues to put together fantastic lineups, and this month is no different. I'm copying the full slate below, but if you need a two-second reason to come, Amy Sohn's latest novel, Prospect Park West, takes place in Park Slope and has drawn lots of local attention for its sharp send-up of local Slopers and their establishments (including Matt Roff's other joint, Southpaw). See you there! AMY SOHN is the author of the novels Prospect Park West, My Old Man and Run Catch Kiss. She has also written for New York Magazine, The New York Times, The Nation and Harper's Bazaar and has written television pilots for such networks as HBO, Fox and ABC. A former New York Magazine editor, she was also a columnist for the New York Post and New York Press. SAÏD SAYRAFIEZADEH, the author of the memoir When Skateboards Will Be Free, is a writer and dramatist. He was born in Brooklyn, New York in 1968 to an Iranian father and a Jewish-American mother, both of whom were members of the Socialist Workers Party. His stories and essays have appeared in The New York Times, The Paris Review, Granta, Open City and elsewhere. His work has also been featured in the anthologies Lost and Found: Stories from New York and Love is a Four-Letter Word: True Stories of Breakups, Bad Relationships, and Broken Hearts. His plays include Autobiography of a Terrorist and New York Is Bleeding. JOBIE HUGHES is co-writing a young adult science fiction series with James Frey. The first book in the series, I Am Number Four, will be published by HarperCollins in 2010. DreamWorks Pictures is producing a film based on the novel, which will be executive produced by Steven Spielberg and produced and directed by Michael Bay. In 2009 Jobie graduated from Columbia University with an MFA degree in Creative Writing. His forthcoming novel for adults is Agony at Dawn. LIANNE STOKES is a freelance writer and comedian. Her writing has appeared in New York Press and Playgirl and on tangomag.com. “Handsome,” her essay on her spurned love for a co-worker, was included in the anthology Rejected: Tales of the Failed, Dumped and Canceled. She is working on a memoir called Laid Off: Booze and Dreams in the Office. The lady and I were finishing a run when we turned onto Franklin just after 8:00 PM and found the avenue packed with fire engines and ladder trucks. Two of the ladders were extended to the roof of the century-old block between Lincoln and St. John's on the east side, and a sizeable crowd had gathered. The fire itself was out when we passed, but it had completely gutted the top floor of 787 Franklin, an apartment. All of the firefighters I talked to (it was at least a two-alarm blaze, maybe three, based on the number of trucks on the scene) said that everyone got out unharmed. The FDNY also did a great job protecting the rest of the block--lights on in the apartments below and adjacent to the blaze suggested that damage was minimal (though I'm sure water damage will hurt the folks below). No one from FDNY on the scene knew the cause of the fire, which inspectors will determine later tonight. While I'm sure they're thankful that no one was hurt, I feel terrible for whoever lost their place and everything in it. 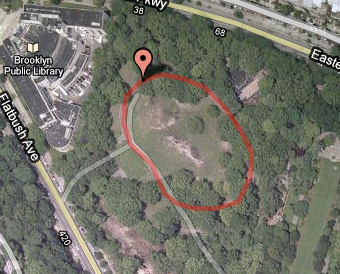 If anyone knows the residents and can suggest any way to help, please post it here or on Brooklynian. I love my bodega. 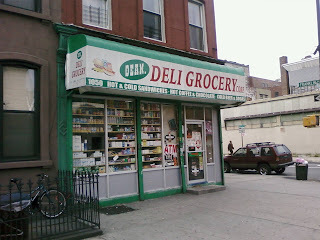 Call it a deli, call it a grocery, call it whatever you want, but the guys inside never let me down. They're open 24-7, 365. They've got everything: light bulbs, Drain-O, mac 'n cheese, apples, and once, when I really needed it, a bike pump. They've also got the incredible deals that seem only to exist in Brooklyn's bodegas: the 25-cent peanuts, the 35-cent ice cream sandwiches, the candy bars for 75 cents (Duane Reade sells them for $1.19 now! ), the dollar bagel and cream cheese, and 40 oz. of PBR for $2.75 (that's what the lady and I call date night). 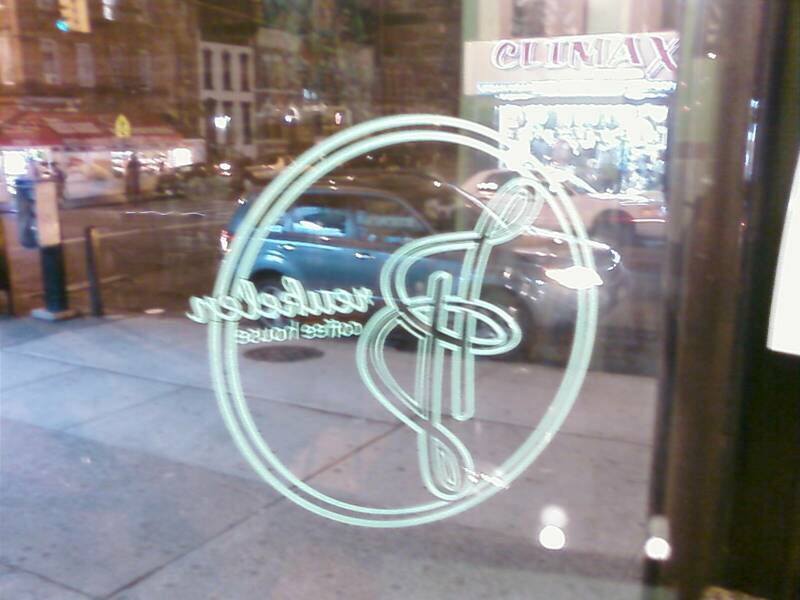 They make a mean sandwich, whether I want it at 11AM or 1AM, and they never worry if somebody's a few cents short. I never feel closer to being a New Yorker than when I say it--I love my bodega. The gents behind the counter hail (as do many local grocers) from Yemen, and they're always good for a story or a laugh. Waiting for my sandwich the other night, the owner, Mohammad, shared one that struck me as worth retelling. Making conversation, I asked how long they'd been on the corner of Dean and Franklin, and Mohammad told me twenty-seven years. I followed with the obligatory comment about "you must have seen a lot of changes" and Mohammad replied "Yeah, yeah. A long time ago, I got shot." My eyes widened as he continued. "There was a lady outside, and three guys were trying to rob her. I had a gun then, with a license, so I went outside and scared them off. The next day, they came into the shop and stood at the counter threatening me." Mohammad showed me how he had hidden one hand beneath the counter, which kept the troublemakers on edge because they thought he had his weapon. What started as a tense encounter began to turn friendly, and thinking the danger had passed, Mohammad pulled his hand out as a show of good faith. "That's when he shot me," he said, pointing to where the bullet had torn through his shoulder and exited his back. "He fired three times, very quickly, and I fell to the floor. 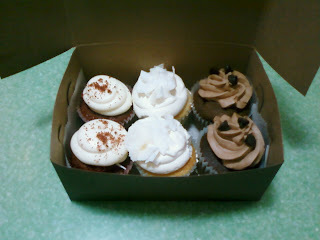 The guy tried to reach over the counter and shoot me in the head, but he missed, and then they panicked and left." The other guys in the store called 911, and Mohammad escaped with his life and a shoulder full of bullet fragments (they remain to this day). Stunned, I only mustered a "wow" as Mohammad paused to let his description sink in. Then he added, "About a month later, they got him." My eyes must have betrayed my alarm, because he laughed and said "Not anyone I know. Another gang. That's how it goes. I never chased after him." After one of the midsummer shootings, I remember walking into Mohammad's place and finding it packed with concerned locals, all talking at once about what had just happened outside. I've never felt more like an interloper, and I hung back, watching Mohammad calmly field questions and nod sympathetically as people sought information and shared stories and opinions of similar incidents of gun violence. At the time, I was impressed with his statesman's comportment, and his recent story adds a layer of logic to it--he's been here as long as anyone, and he's survived the very worst Franklin Avenue has to offer. When, on my way out with my sandwich last week, I said "Well, I'm glad your still here!" he replied with a wry smile "I'm always here." 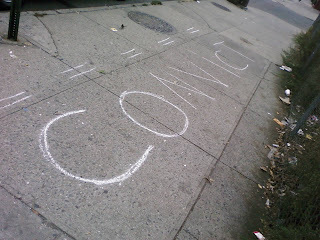 - I'm not sure why it says "CONVICT" on the sidewalk between St. Marks and Bergen, but it's in the same style as the "HOLY" that was written up by the subway entrance a few weeks ago. Maybe it's a question for the folks at Crown Heights Creative. - Speaking of creative, kudos to Brooklyn (with at least one member living nearby) band The House Floor, who scored a rave review on NPR's All Songs Considered blog. You can download their debut album at their website, linked above. - Gothamist reports that the Starlite Lounge on Nostrand and Bergen, Brooklyn's oldest gay bar, may be forced to close by new ownership. As usual, the news was on Brooklynian first, where posters mentioned that you can swing by the bar (still open as of yet) to sign a petition. Someone who knows the bar and management better than I should get an online petition going. It's been more than six decades since real estate investor Peter Malkin, 75, rode the trolley to PS 241 on President St. in Crown Heights, but the school came to mind first as one of the key experiences of his youth. "I thought perhaps I could bring to that student body...some exposure to things that were not otherwise available to them," said Malkin, who leads the real estate group that owns the Empire State Building. Malkin has donated a playground, a computer center and a piano to the school. He funds weekly violin lessons for about 100 students, an after-school program that offers soccer, music and ballroom dance training and other cultural programs. Each month, he rewards 20 kids with bookstore gift cards. 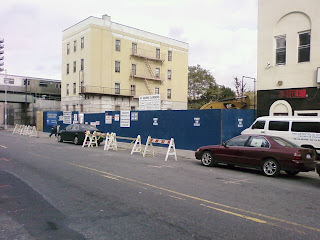 - Thanks to Nostrand Park for the link, and for the nice picture of Franklin Park's new burger joint, which is coming along. What I was calling the "radiology building" appears to be three distinct buildings that are currently being redeveloped. I took a quick look at the building permits to see what the scope of the work is and when they were issued. Convert existing public building into accessory parking with apartments above. Cut and demolish part of the rear as shown in plans. I looked through the gate, and see that there's already a huge hole in the back of the building, and that the first floor is being gutted for parking. 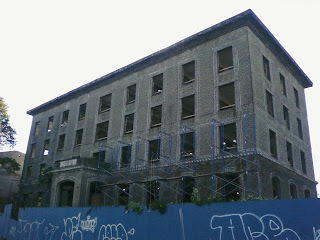 The building has already had the awful blue plastic (fiberglass?) stuff they used in the fifties and sixties in window openings removed. That change alone makes the building look less bad. Inside, it looks like some internal wall framing is taking place. There is a real estate sign on that part of the building saying that the space is 15-20,000 sq feet, and comes with 25 parking spaces. 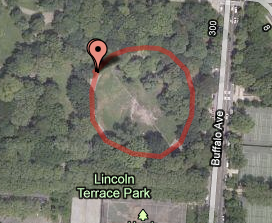 Looks like more groceries are coming to the neighborhood - its an open question as to what kind of market it will be. I'm a little unclear as to the fate of the third building, this one is a single story street front building that says "radiation therapy" on it. My guess is that it is covered under the permit for the main part of the wing, and is going to be demolished to become space for parking, either for the supermarket or the apartment building, though its unclear as it looks untouched thus far. No loss if they do tear it down though, that building is about as ugly as they come. The photos above capture the change in the building over the past ten months: rows of windows being knocked through the old walls and the interior framing that Nat mentions going up. The owners have been advertising the one building as a potential supermarket since I arrived 16 months ago, but perhaps a renovated space and a whole lot of new residents will entice someone to open up. A quick link before I sleep: this summer, a group of Brooklyn-based skateboarders hanging out at Rival Skate Shop were challenged to take, and document, a cross-country Greyhound trip to The Berrics Skate Park in Los Angeles. They did, and the first episode of their final product, "From Brooklyn to the Berrics," is up now. 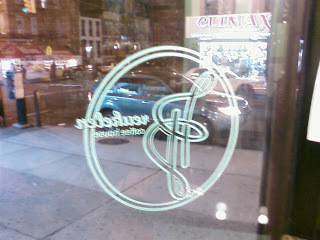 Franklin Avenue folks will recognize one of our own, Jay from the Breukelen Coffee House, rocking out in their midst. 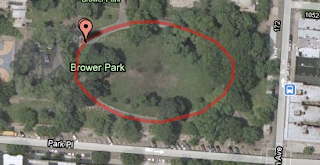 One event I forgot, happening today (Sunday) - The Crown Heights CSA Year-End Party, at Franklin Park from 2-5pm, featuring a visit from the farmers and information about winter shares and plans for next year. 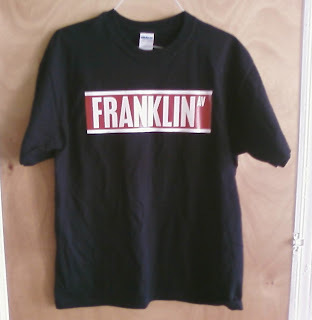 The Pana Store, at Park and Franklin, is selling a great t-shirt for 16 bucks. Judging from the steady migration of this shirt's display location from the back of the store to the front of their window, I'm guessing it's a hot seller. Weekend weather looks beautiful, so get out and enjoy it. Here are some upcoming events (this week and next) to keep in mind. - Tonight is the latest installment of Target First Saturdays at Brooklyn Museum, and for those who don't know the area, or don't like the cold, Heart of Brooklyn will be running their neighborhood shuttle, staffed by locals and stocked with maps of food and drink destinations. - Nostrand Park reminded me that it's the last weekend to go see Housing is a Human Right at Wash and Play Lotto Laundromat in Fort Greene. - Next Saturday, Sue Rock Originals is hosting a rent party at their space on Bergen between Bedford and Nostrand. If you haven't heard about Sue Rock, she's pretty amazing, and it'd be a shame if she lost her space, so please consider making a donation if you can't make the party. - Finally, the Franklin Park Reading Series returns next Monday, November 16th, with a heckuva lineup (Facebook invite here). More on this next week, but mark your calendar. It's just a big hole right now, but much of the space between Franklin and the shuttle tracks on St. Marks will soon be occupied by St. Marks Gardens, an 8-story, 38 unit affordable housing development courtesy of ABS Architects (the rendering above is from their website) and the city, whose Affordable Housing NYC banner hangs on the side of the plywood facing the site. - The NYTimes has a fascinating block-by-block map of the mayoral election returns. There's much to be said about the race and class breakdowns indicated herein, particularly on the borders of areas undergoing gentrification or neighborhood change, but I'll leave those conclusions undrawn for now. - CNN ran a fascinating article on Brooklyn youth learning the cowboy trade in Queens. - Nostrand Park is soliciting suggestions for Uncommon Gentrification Indicators, and their quest was picked up by Brownstoner, which brought in over 100 total responses. The results are somewhat predictable, but interesting nonetheless. If anyone out there can think of a way to represent these visually, I'll post it. This renovation is old news, but it was new to me. In the late 19th Century, a spectacular new hospital was built on St. Marks Place between Rochester and Buffalo by the Diocese of Brooklyn. St. Mary's was founded under the guidance of builder-Bishop John Loughlin in 1867 in Cobble Hill (Loughlin also oversaw the founding and building of St. John's College and the unfinished cathedral that became St. John the Baptist in Bed-Stuy), but it quickly outgrew its surroundings, and construction began in Crown Heights in 1879. The block-long complex included a nursing school, Shevlin Hall, whose buildings were spared when the original hospital was replaced with a more modern building in the 1970s (pictured above). 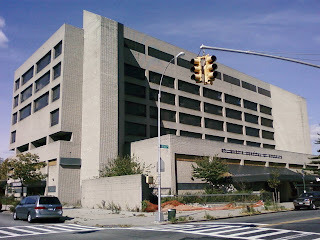 Still called St. Mary's, this hospital served Crown Heights until 2005, when its bankrupt parent, St. Vincent Catholic Medical Centers, was forced to close it on account of declining patient numbers. 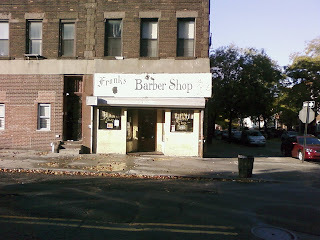 The sad irony is that this neighborhood institution, whose closing occasioned a lengthy retrospective in the NYTimes and put hundreds of residents out of work, was done in by trends which are typically harbingers of positive neighborhood change, specifically reduced gun crime and a reduction in AIDS-related cases. 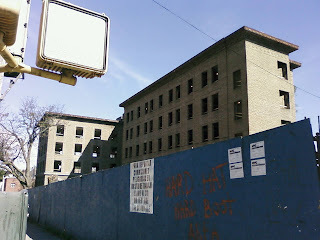 What's left now is a huge, vaguely brutalist concrete hospital building that seems likely to be demolished (unless it is re-opened as a hospital soon, and there are no plans to do that) and Shevlin Hall, the stately nursing quarters. 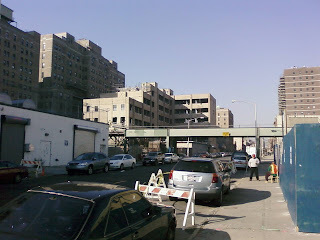 The Hall garnered considerable attention from the other end of Crown Heights in 2005, when Bruce Ratner considered purchasing it to move affordable housing units required by the state for his Atlantic Yards project off-site. The building is currently under construction for residential use, potentially assisted living, and it looks as though Shevlin Hall will outlive not one but two hospital buildings, not to mention the hospital itself. On an unrelated note, I hope Mayor Bloomberg views his close victory as evidence of the considerable damage he did to New Yorkers' trust with his term limits extension, and not as a lesson in the power of wealth to buy nearly anything. Nostrand Park was kind enough to ask, but I'm just going to say it: Eight is Enough. The folks who voted at Nostrand Park's poll agree with me. The voters who went to the primaries and the runoff elections agreed with me, electing two vocal opponents of the term-limit extension. The whole city agreed with me, voting in favor of term limits not once but twice. Bloomberg himself agreed with me as recently as 2005, when he called attempts to subvert the will of the people and repeal or change term limits "disgraceful." The mayor has lavished a ludicrous amount of money on his current campaign, 14 times what Bill Thompson has spent, in an attempt to make the issue go away, but it remains central to the campaign. Should we re-elect an effective, successful mayor who saw fit to run roughshod over the restrains put on his power by the people of New York City? Bloomberg will almost certainly win today, in part because of his bottomless campaign coffers, in part because of the recognition and prestige afforded by incumbency (as well as all the campaign-trail arguments about experience and continuity), and in part because many people think he's the best man for the job. These individuals will argue that even if leading the charge to change term limits was a bad call on the mayor's part, the election should always be about giving New York City over to the most capable pair of hands. We may have a hard time getting past a blatant smothering of democracy by a billionaire, they say, but that's over and done with, and the question now is which candidate would make the best mayor. In truth, the two questions can't be disentangled. Bloomberg's decision to mow down term limits reveals a disdain for popular opinion and the democratic process that cannot be set aside once he retains his last of three terms. Even if you think this is a one-time thing, it's extremely troubling, but this isn't new behavior. The two photos above speak volumes about the way the mayor's modus operandi shifts as he deals with different social classes. In 2003, Snapple was awarded an exclusive five-year contract, essentially a sweetheart deal, by the mayor's team to put their products in NYC schools. Thompson, to his credit, opposed the move. When the handling of the contract bid was criticized, as was Snapple's product placement, the mayor called it "political red tape." 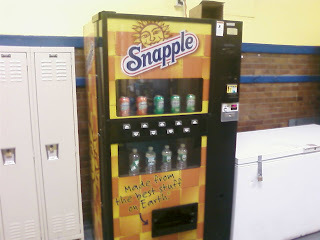 Snapple's in-school products may be relatively healthy (100% juice, which their retail products are not), but their presence is obviously to build brand loyalty that translates to bigger sales of their high-calorie sugar chugs outside school doors. 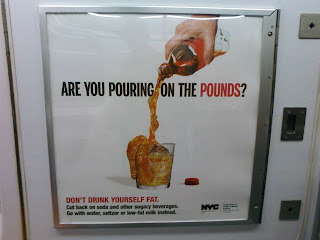 Six years later, Bloomberg has just launched his latest anti-obesity ads, which include images of Snapple bottles, and tell straphangers not to "drink themselves fat" by "pouring on the pounds." My day job is in health and fitness education, and while I think educating the public about calorie intake is one of Bloomberg's better moves, I don't like these ads at all. They essentially call people fat, which is ineffective if you're trying to motivate people to change their lifestyle and substitutes a re-iteration of American body-image insecurities for real education. Besides, if you want people to drink less Snapple, it would be far more effective to keep it out of schools than to insult people on the subway. The administration's double-standard here demonstrates an uncomfortable politics that takes a patronizing, stern parent approach to the hoi palloi while making deals with corporations. Finally, Bloomberg recently struck a local nerve, deploying Rudy Giuliani to stoke fear and racism by raising the specter of the Crown Heights Riots in bashing Bill Thompson. Power corrupts, absolute power corrupts absolutely, and while Mike Bloomberg may have been a good mayor, his recent behavior is not commensurate with the preservation of functional democracy in New York City. On that note, I'm volunteering for Mark Winston Griffith in a few hours, so I'm going to bed. Vote today!